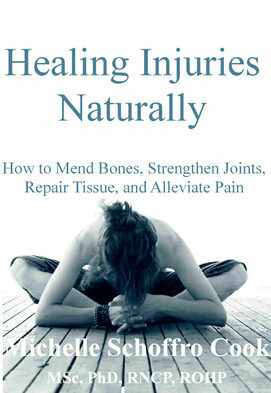 In this classic 192-page e-book, Healing Injuries the Natural Way, Dr. Cook outlines her all-natural protocol to speed recovery from a wide variety of injuries. If you've been injured, are suffering from pain, or want to prevent osteoporosis Healing Injuries the Natural Way is for you. This e-book, provides a natural approach to healing various types of bone, soft tissue and joint injuries, as well as injuries related to osteoporosis, arthritis and fibromyalgia. Download this book NOW in .pdf form (works on most computers) for only $16.95.